Miranda Updike today joined The John Updike Childhood Home board of directors. The board of directors for The John Updike Society, which owns The John Updike Childhood Home and is turning it into a museum, had voted to create a separate governing board for the Childhood Home, consisting of the JUS board of directors plus a member of the Updike family and a curator/director, should the board eventually hire one to manage the property. Miranda will serve as the family representative. Miranda, the youngest child of John Updike and Mary (Pennington Updike) Weatherall, is an artist who lives and works in Ipswich, Mass. Born the same year Rabbit, Run was published, she received her BFA from Mass. College of Art, where she studied with George Nick and Jo Sandman. 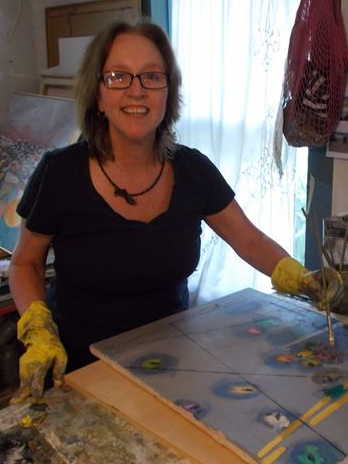 Since graduating in 1993, Miranda has shown her work in numerous exhibits in and around the Boston area and also works on commissions. She brings to the board not only a family perspective but an artistic one, and the Society is grateful for her participation. This entry was posted in House news. Bookmark the permalink.